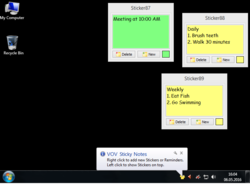 Add stickers to your desktop and create reminders for your upcoming events! 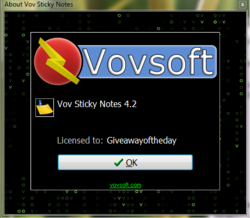 Vov Sticky Notes 4.2 was available as a giveaway on April 20, 2018! Once you install it on your PC, the application automatically goes to the system tray, and you can right-click its icon when you want to create a new note. It basically opens a resizable window where you can paste text or start typing some of your important tasks. Another handy function of Vov Sticky Notes is that you can create reminders to be displayed on a regular basis. You only need to choose the frequency interval, and then enter an appropriate message. 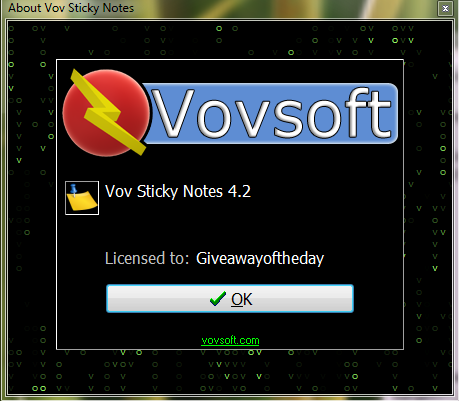 How would you improve Vov Sticky Notes 4.2? I don't usually like this feature, but it seems appropriate for this program. Add a setting to allow the user to have it start up on Windows startup. "stickynotesvov"="\"D:\\Program Files (x86)\\VOVSOFT\\Vov Sticky Notes\\sticky.exe\""
paste above to txt document change .txt to .reg and import to registry. after that it will always start with windows. Fred, Windows Registry Editor Version 5.00 [HKEY_LOCAL_MACHINE\SOFTWARE\Microsoft\Windows\CurrentVersion\Run] "stickynotesvov"="\"D:\\Program Files (x86)\\VOVSOFT\\Vov Sticky Notes\\sticky.exe\"" paste above to txt document change .txt to .reg and import to registry. after that it will always start with windows. Activation failed! shows every time I want to register using the registration key provided in VovStickyNotes42-db38si.zip. What can I do? The limited time is about 8 hrs left and carrying on. Help, please!!! Johannes Magister, Activation requires the program to have access to the internet, something must be blocking outbound https request to the activation server. It worked for me after I permitted the program to access the internet for activation. Not to disrespect this program or Windows Sticky Notes but I've been using the Note Board Sticky Notes Add-on for the Chrome Browser. It works for me. Thanks for the off GAOTD but I'll pass on this one. They could change those buttons to something more discrete... they scream windows 95. 1. When writing a note it changes the keyboard, e.g from USA to GB. (The ditto mark, alias quote, and the at sign @ above 2 are interchanged). Not terrible, just do not worry. 2. The excellent settings options for colour, background and font on the sticker are sadly not available for the reminder, which gives just a heavy thick ugly typeface, which is a pity but beggars cannot be choosers. Still it works, and well. Excellent, thank you Vov and GAOTD. Two points to note: 1. When writing a note it changes the keyboard, e.g from USA to GB. (The ditto mark, alias quote, and the at sign @ above 2 are interchanged). Not terrible, just do not worry. 2. The excellent settings options for colour, background and font on the sticker are sadly not available for the reminder, which gives just a heavy thick ugly typeface, which is a pity but beggars cannot be choosers. Still it works, and well. almost nothing and still get paid. There are many free alternatives that can do far more. ...wow...let me guess...you'll want all that for free too ? Frank, ...wow...let me guess...you'll want all that for free too ? There are many sticky note programs out there. The author wants improvement suggestions. Where are your noteworthy suggestions ? Mothman, There are many sticky note programs out there. The author wants improvement suggestions. Where are your noteworthy suggestions ? I am unable to register using registration key. The activation failed! shows again and again. I am using windows 10 1709 latest version. May be it is due to firewall protection by windows defender. Unlike the built in, will this allow you to save or recover text from the notes if one is delete? I like it - works fine on Windows 10, 64 bits. Better than WIndows version, as it goes down on the task bar. aza: I loathe Windows 10 so continue to run Windows 7 instead with the taskbar restored to where it should've always been left by Microsoft. Start / search programs, type in Sticky Notes, right click / Send to desktop (create shortcut) and then move the shortcut into the taskbar. Takes all of 20 seconds. Open Windows Sticky Notes from the Quick Launch icon. Write whatever you want. Close Windows Sticky Notes window from the taskbar icon. Simple. No notes are deleted by closing the window; they merely disappear from the desktop. aza: I loathe Windows 10 so continue to run Windows 7 instead with the taskbar restored to where it should've always been left by Microsoft. Start / search programs, type in Sticky Notes, right click / Send to desktop (create shortcut) and then move the shortcut into the taskbar. Takes all of 20 seconds. 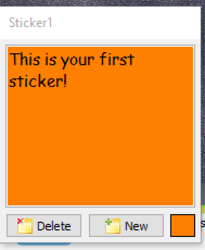 Open Windows Sticky Notes from the Quick Launch icon. Write whatever you want. <b>Close Windows Sticky Notes window from the taskbar icon.</b> Simple. No notes are deleted by closing the window; they merely disappear from the desktop. Kestrel, yeah Windows has one too. But this allows you to control the text and the size. Also Windows doesn't have a default tool like this one offers," A Reminder". I like tools that has these kind of feature. But i kind a didn't like this tool, because it doesn't offer a user with "Hotkeys" or "Global hotkeys". A Reminder does its job, but there is more text in windows. Hope u'll understand, changing the text size from the Settings doesn't seem to have any affect in the Reminder Window. Kind a limited. Settings only applies to Sticky's. The default theme looks the best from other options. Its simple, it can be made beautiful and a lot of work needs to be put to develop it. There is future for this tool, i think. 9.99$, i wouldn't buy it, though! Will uninstall, i am already using better one, like PNotes and Active Desktop Calender, that allow a Reminder. Vovsoft has other better tools like Text Edit Plus, i am wondering GAOTD never offered such tools like Text editor, except for one that can handle doc and docx files. Kestrel, yeah Windows has one too. But this allows you to control the text and the size. Also Windows doesn't have a default tool like this one offers," A Reminder". I like tools that has these kind of feature. But i kind a didn't like this tool, because it doesn't offer a user with "Hotkeys" or "Global hotkeys". A Reminder does its job, but there is more text in windows. Hope u'll understand, changing the text size from the Settings doesn't seem to have any affect in the Reminder Window. Kind a limited. Settings only applies to Sticky's. The default theme looks the best from other options. Its simple, it can be made beautiful and a lot of work needs to be put to develop it. There is future for this tool, i think. 9.99$, i wouldn't buy it, though! Will uninstall, i am already using better one, like PNotes and Active Desktop Calender, that allow a Reminder. Vovsoft has other better tools like Text Edit Plus, i am wondering GAOTD never offered such tools like Text editor, except for one that can handle doc and docx files. Endomondo, I found your note hard to understand but have explained it more clearly in #11. I agree with the first part of your note about reminder but will not uninstall and replace. Laxative, yes it is. They don't understand my writing. English is not my mother tongue, so my mind is not conditioned like your's( foreign people or white ). I think u r foreigner. This tool is good i think, it can be better. Laxative, yes it is. They don't understand my writing. English is not my mother tongue, so my mind is not conditioned like your's( foreign people or white ). I think u r foreigner. I agree with your comment. This tool is good i think, it can be better. You're kidding me, right? We've had sticky notes built into Windows since Windows 95! What next? A simple calculator? LMFAO. MarkCM, So your comment is not meant for everyone to understand, only for those who are `aware' and `in touch' and have nothing else to do in life but to keep up with the latest twadlle and slang, calling all others ignorant and buffoons? My ‘other suggestions' are of course manic and meaningless, but no more so than yours. Finally I do object to taking the Divine Name in vain, a sure sign of ignorance. I suggest that you either write comments for normal intelligent people to understand, or explain them, or lay off. But perhaps you are not capable. MarkCM, So your comment is not meant for everyone to understand, only for those who are `aware' and `in touch' and have nothing else to do in life but to keep up with the latest twadlle and slang, calling all others ignorant and buffoons? My ‘other suggestions' are of course manic and meaningless, but no more so than yours. Finally I do object to taking the Divine Name in vain, a sure sign of ignorance. I suggest that you either write comments for normal intelligent people to understand, or explain them, or lay off. But perhaps you are not capable. Kestrel, this one seems better. Kestrel, Kestrel, Indeed, the Microsoft Sticky Notes App and Win 10 latest version does this and links to my phone for alerts vie Cortana App. Completely free and looks much better. Gary,..... it seems better. Do you think so? Laxative, Start menu - 'Sticky Notes'. Kestrel, In Vista MS Sticky Notes is unsuable since we cannot TYPE a note! We can record a voice note and scribble on the note using mouse, touch pad or touchscreen but no facilty to type anything at all! In Windows 10 I can type into the Sticky Notes App but it is still very basic with no scheduling the display as a reminder note or any space saving activity like collapsing a note to the first line until moused over. Kestrel, In Vista MS Sticky Notes is unsuable since we cannot TYPE a note! We can record a voice note and scribble on the note using mouse, touch pad or touchscreen but no facilty to type anything at all! In Windows 10 I can type into the Sticky Notes App but it is still very basic with no scheduling the display as a reminder note or any space saving activity like collapsing a note to the first line until moused over. TK .. DaRN iT ... All you guys suggestions can't seem to Help my TRS 80 and Vov Sticky Notes 4.2 Model # 1348y5h48996e684h.